John's music accompanies stories of the Australian High Country on the CD, High Country Life, by Melissa Kenihan. Several pieces were composed specifically for this project. Visit the High Country Life website to order or listen to samples. 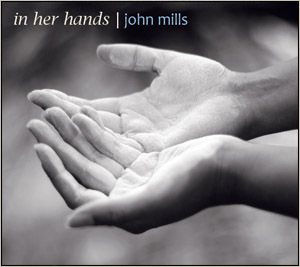 in her hands is the fourth studio album by Australian guitarist and composer, John Mills. John’s exquisitely beautiful acoustic guitar playing is at the heart of each of the tracks, with some equally beautiful backdrops that include African kalimba, cello, piano and haunting Tibetan singing bowls. in her hands follows on from two internationally successful albums, both of which charted in the ambient top ten (U.S.): Hallowed Moon and Still Gazing at the Moon, released Stateside on U.S. label Eversound, have both achieved wide critical acclaim. John has once again collaborated with internationally renowned producer Adrian Hannan from Melbourne’s boutique studio and Artist Development Agency, The Song Store. John’s music is difficult to pigeonhole … is it classical? … is it contemporary? … is it ambient or new age? … It is all of these and more. It is music written from the heart, and without exception, the phrase used to describe John’s music is, absolutely beautiful. Copyright © 1994- John Mills. All rights reserved.